U.S. Flag Store's Missouri State Flag is printed in America on Nylon flag fabric. Since this flag is made in America, U.S. Flag Store is able to ensure that the complex State emblems are printed with accuracy, sharp detail and bright colors. This outdoor Missouri State Flag is finished with the same high quality materials as all of U.S. Flag Store's US flags, and is extremely durable and long lasting. Design: A flag comprised of three equally sized horizontal stripes of red, white, and blue. The Great Seal of Missouri is placed in the center of the flag. Missouri's seal is comprised of many elements, including: two grizzly bears, the U.S. coat of arms, a crescent moon, the phrase "United We Stand, Divided We Fall", the Missouri state motto "Salus Populi Suprema Lex Esto", the Roman numerals for the year 1820, and two groups of 24 stars. Meaning: Red, white, and blue are used because they are the national colors of the U.S. and represent valor, purity, and justice. The two grizzly bears represent strength, the U.S. coat of arms signifies Missouri's allegiance to the country, and the crescent moon symbolizes Missouri's status as a new state. 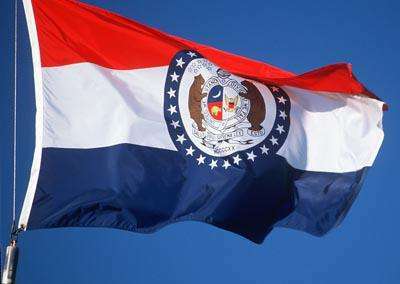 The state motto means "Let the Welfare of the People Be the Supreme Law", the Roman numerals represent the year that Missouri became a U.S. state, and the 24 stars represent the fact that Missouri was the 24th state to join the union. The Missouri state flag was created by Marie Elizabeth Watkins Oliver, who was a citizen of Cape Girardeau, Missouri. Marie Oliver was the wife of State Senator R.B. Oliver and a truly proud citizen of the state of Missouri. In 1904 Mrs. Oliver joined the Daughters of the American Revolution (DAR) and became involved in many Missouri activities. In 1908, one of these activities involved creating an official flag for Missouri. Although Missouri had been a state since 1820 and adopted a state seal in 1822, there was not official state flag. The members of the Missouri DAR took it upon themselves to solve this problem and appointed Mrs. Oliver as the chairperson of the flag design committee. Oliver took this job very seriously and spent a lot of time researching the flags of other U.S. states. She wrote every state and asked for information on that state's experience designing and adopting an official state flag. After she finished all of her research, Oliver decided to follow in the popular U.S. tradition of using a State's seal as a flag design. She created a flag design for Missouri that incorporated the Great Seal of Missouri and had her friend, artist Mary Kochitzky, paint a paper prototype to present to Missouri Legislature. Two bills to adopt the flag were introduced to Missouri Legislature in 1909 and 1911, but both failed to pass. Finally, on March 22nd, 1913, Marie Oliver's flag design was adopted with the Oliver Flag Bill.